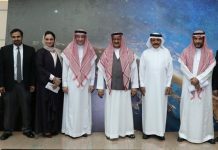 A seminar series has been initiated in an effort to enhance collaboration between KACST Natural Resources & Environment Research Institute (NRERI) and Alfaisal University. The first talk in this series “Transcriptional Factors as Therapeutic Targets” was given by an expert in Molecular Biology from the College of Science at Alfaisal, Dr. Alexander Kouzmenko. The audience was welcomed by Dr. Abdulaziz Al-Swailem, the Director of the NRERI. Several dozen people attended the event which is held on the last Tuesday of each month and rotates between the two institutions. One of the areas that was covered in the talk, for example, dealt with the processes of aging. In the developed organism, pluripotent adult stem cells are responsible for constant replenishment of damaged terminally differentiated cells and thereby, rejuvenation of tissues and organ regeneration. Diminished capacity of stem cells for self-renewal accelerates aging and promotes development of degenerative disorders. Recent progress in studies on the role of transcriptional factors in stem cell physiology provides basis for development of new strategies for prevention of premature aging and treatment of degenerative disorders. Dr. Alexander Kouzmenko is a Professor of Molecular Biology at Alfaisal University and Adjunct Professor at the KFSH&RC. He received his PhD degree in Biochemistry and Molecular Biology from the Institute of Cytology and Genetics in the former USSR. Dr. Kouzmenko taught and conducted research at world leading universities and research institutions such as the University of Tokyo, Japan; Garvan Institute of Medical Research, Sydney; the University of Melbourne, Australia; and the German Cancer Research Center, Heidelberg, Germany. He is a recipient of several prestigious international academic awards, including the Deutsche Forschungsgemeinschaft and Japanese Society for Promotion of Science Fellowships, and the Japanese Society for Bioscience, Biotechnology & Agrochemistry Award for Excellence. Dr. Kouzmenko has published papers in some of the most influential journals such as Nature, Lancet and the Proceedings of the National Academy of Sciences of the USA. His main scientific interests include signal transduction, regulation of gene expression, nuclear hormone receptor action, adult stem cells, aging and carcinogenesis. 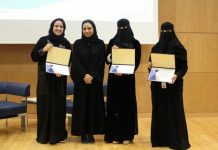 The KACST-Natural Resources & Environment Research Institute (NRERI) was also kind enough to train several Alfaisal undergraduate students in their Biotechnology Laboratory during the summer.